Ogden Nature Center - Host your next event with us! 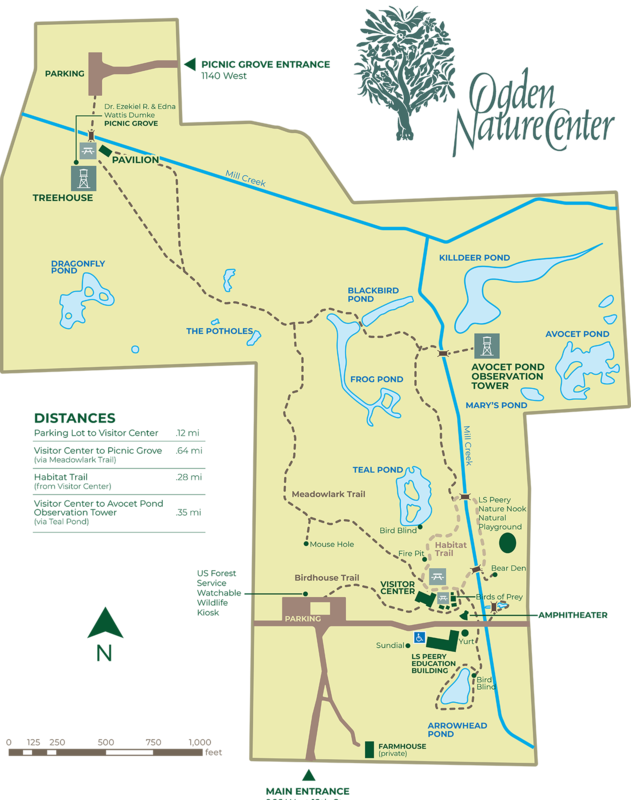 The Ogden Nature Center is a 152-acre nature preserve and education center. Our facilities provide spaces for meetings, classes, and special events. The Ogden Nature Center provides a casual, yet beautiful natural setting for weddings, parties and meetings. We are located in the heart of the city, but you will feel like you are miles away, with meadows, winding trails and stunning vistas all around. The Nature Center offers a variety of indoor and outdoor spaces to accommodate groups of different sizes. The Ogden Nature Center is pleased to offer its unique, outdoor settings for weddings and wedding parties. We offer outside options only for weddings with unparalleled natural vistas in the middle of town! Outdoor spaces are available after business hours for weddings. The available times include setup and cleanup. All cleanup, band equipment, etc. must be removed no later than 10 PM on the day of the event. The security of any items delivered prior to reserved time is not ensured. Note: there is NO RAIN PLAN at ONC. Your wedding party is responsible for rental of tents, canopies, tables, chairs, etc. NO SMOKING is allowed anywhere on the grounds or in the building. No lit flames are allowed. Please use battery operated candles if candles are desired. There are not private rooms available for the bridal party to prepare for the wedding. However, the Discovery Room can be used for such a purpose. There is limited outdoor lighting. You should be prepared to provide lighting should your wedding and/or reception be planned for after dark. Parking is approximately 800 to 1000 feet from the Visitor Center. There is one handicap parking stall near the Visitor Center, and room for two additional vehicles. It is highly suggested that you rent a canopy for your wedding. There is not enough indoor space should the weather turn bad. We recommend Diamond Rental (LINK) as they are familiar with the property. $2,000 for a maximum of 150 people, plus $500 refundable damage deposit. Damage includes stains to carpet or flooring; damage to walls; anything that requires cleaning up (e.g. broken glass, trash, garbage); damage to parking lot plantings, etc. Is your child a nature lover or animal lover? $100 for a 15-minute presentation with either a hawk or an owl. By special arrangement only. The entire balance is due at the time of reservation. A $50 damage deposit check will be collected on the day of the party. If there are no damages, the check will be shredded. No refund will be offered if the party is cancelled less than one week prior to the date of the event. Renters are responsible for the set-up and clean-up of their event. This includes removing off site all personal items, decorations, food and garbage. No smoking inside or out! The Education Center is ideal for larger parties and other events (max. 100 people--business events only/no private parties). Rooms in the Education Center are available weekday evenings from 4 pm - 9 pm and Saturdays, 9 am - 9 pm. Some weekday days (during business hours) maybe available. Please call for scheduling questions, 621-7595. Includes kitchen and restroom facilities, eight - 5' tables and up to 60 chairs. Renter provides all table linens, decorations etc. The Discovery Room, located inside our Visitor Center, is ideal for smaller parties and business meetings. The Discovery Room is available Monday - Friday, 9 am -4 pm & Saturdays, 9 am -3 pm. For an additional fee, the room is available after hours and until 9 pm. Includes restrooms, kitchen facilities, pull down screen with room darkening shades, eight, 6' tables and up to 30 chairs. An LCD projector is available for $25. The Dumke Picnic Grove is located in the Northwest corner ofthe nature preserve. This quiet area is covered by large Box Elder and Cottonwood trees with additional shade offered by a covered, picnic pavilion which seats 75 people. The Grove features restroom facilities, a sink and two tree houses. A near-by parking lot is accessed via Business Depot Ogden. Limited availability - Nature Center summer camps take precedence. Dumke Picnic Grove is available for rent May through October (contingent upon weather) and during regular business hours, Monday- Friday, 9 am - 4 pm, Saturday, 9 am- 3 pm. Download the Driving Directions to Dumke Picnic Grove. Close by the Visitor Center are two beautiful outdoor rental spaces: the Visitor Center Back Yard (max. 150 people) and the Visitor Center East Side Area (max. 25 people). The Visitor Center picnic areas are available for rent during regular business hours Monday-Friday, 9 am - 4 pm, and Saturday, 9 am - 3 pm, closed on Sundays. Rentals are responsible for providing all decorations, food and beverages. Renters are responsible for the set-up and clean-up of their event.This includes removing off site all personal items, decorations, food and garbage. Do not distrub the wildlife. No pets (service animals are welcome). Directions From 1-15, take exit #344 and head east 1.5 mi.